Today I found a few moments to snap a picture of the blue Olympia. Our office is decorated in a very 50s style, so this typewriter looked right at home. I went to the hardware store and bought some small rubber washers to replace the original squashed frame bushings. Such a small repair made the world of difference. I want to go through and clean all the eraser dust (there is enough in there to make a new eraser) and play around with the shift in hopes to make it lighter. It's a wonderful machine with a smooth action. I'm excited to see some reactions to it. Nice looking Olympia. 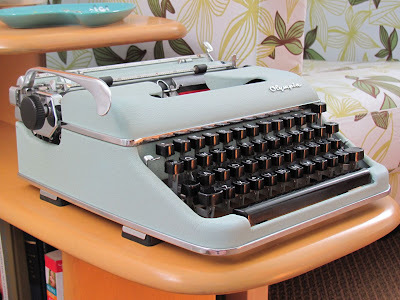 The SM-3 is nothing short of being the Cadillac of portable typewriters, in my opinion. Looks nice and clean (outside, anyway!). Very nice! I hadn't seen that color before. I wonder how many colors they offered?